My first vehicle was a dirt bike, my first license to drive was a motorcycle permit. I have ridden and built motorcycles, cars vans…anything with wheels since I was 11 years old. I also started drinking and experimenting with drugs at 11 years old. I was privileged to be raised in a great, professional and loving household that dissolved in tragic divorce like so many in the 1960 & 70’s. My father was still quite affluent and we enjoyed the benefits of it. I attended private school and was trained up for business. I grew up during the Vietnam war and all of us knew we were going in so I enlisted with one of my best friends, Mike Ransow, in 1974 to be in the Army. He and I planned to save our money, buy our Harleys and ride home for several months after our hitch; just like Easy Rider… best laid plans. Drinking and drugs were the standard for living in the Army and I fit in great. I got married and had my first son just after finishing my tour in 1978. My brother came out to Washington state and we drove cross country in my 1956 Chevy. I traded that Chevy for a Sportster in 1979 and rebuilt it in my kitchen. I bought my first business and started to enjoy the pastime of the 1980’s… cocaine, beer, MTV, video games Riding choppers and looking for trouble. I got my next Shovelhead and started hanging around with a club and loved the lifestyle and the electric punch! In time, I lost my home, wife, kids, dog and license to drive. I was giving up driving/Riding in order to drink and that’s when it dawned on me that I was an alcoholic and drug addict. I started attending AA, NA, Adult Children of Alcoholics and counseling. I married again, had a baby and got divorced again. Now I was riding to meetings, drinking coffee and getting tattoos. I moved in with my mother, broke, busted and in debt $50,000, separated from another child and living off $40 bucks a week after paying 1/3 of my pay to the government, x1 and x2. Good times, but I had my beloved Flathead big twin and could ride anywhere. ( I have never been without a motorcycle) I decided to go to a Bible study cause I had nothing to lose, can’t get worse! I was amazed at what I learned, how the Bible actually applied to real life right now. I became whole; I know who I am and what I was made for. I married an amazing and gifted woman, raised 5 children, built a couple of businesses and have been in active ministry since 1994, was active in a motorcycle ministry since 2006 that went out to my old friends that were now all 1%ers, earned a Masters in Divinity in 2010, and with the help and support of our Pastor; Deb and I earned credentials through the Assemblies of God; planted and pastoring Broken Chains Biker Church. With the support of all our friends in that motorcycle ministry, and 1.5 years of prayer and preparation. Broken Chains Biker Church launched April 1, 2011. We left all our past life behind and headed off on a faith journey with Jesus. With all the years of being back and ministering to clubs and other bikers; Deb, our ministry team and I have been missionaries to this culture. 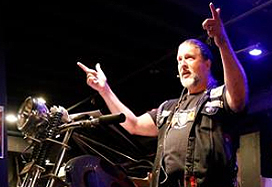 We do Opening prayers on Biker events, Biker Blessings, Hospital visits, Benevolence, Weddings, funerals and baptisms. We are known now throughout the world and we have seen thousands of lives touched and changed. The Lord has richly blessed us! Our faith journey has been amazing and we ask for your prayer support that we might be able to go out further, reach more and demonstrate the power of Holy Spirit life. This ministry field is huge, the mission is always greater than finances, there is so much more we’d like to do. Please pray for provision!